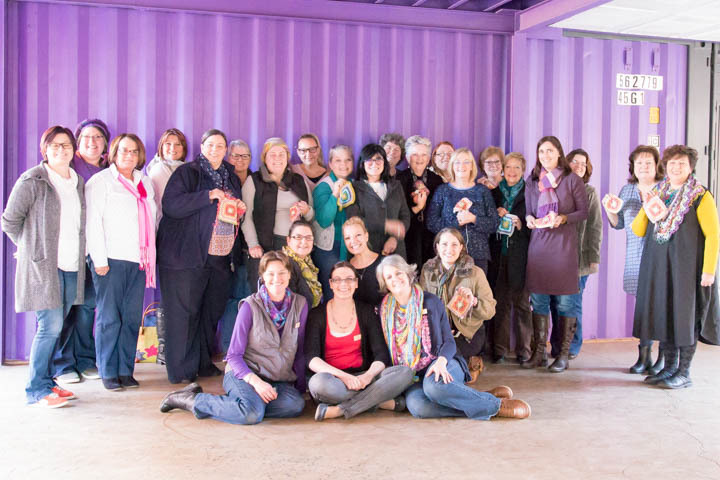 It is hard to believe that it has been almost a month since we finished the last workshop of the Be Inspired crochet tour in South Africa. Today I want to tell you a little bit about the first 2 workshops at 27 Boxes in Melville (Johannesburg). 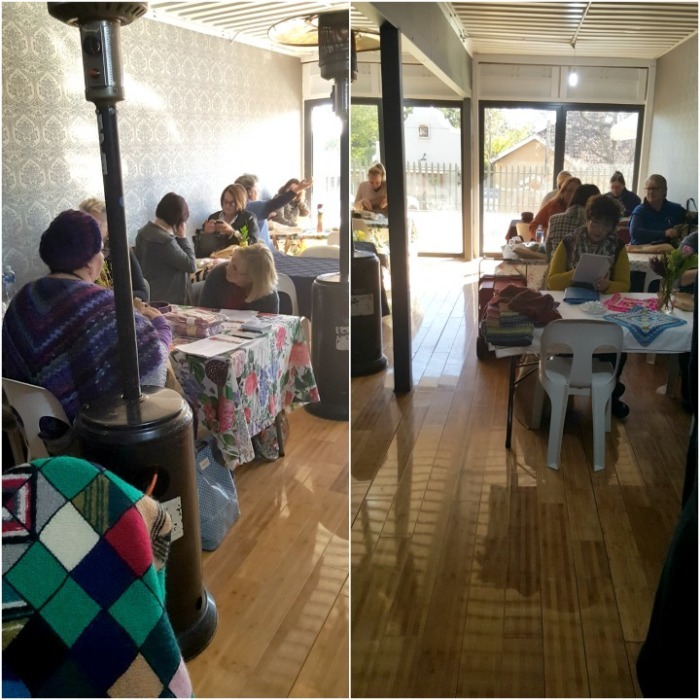 If you read my post about our South African trip, you will know that this is the first in a series of posts about the workshops. 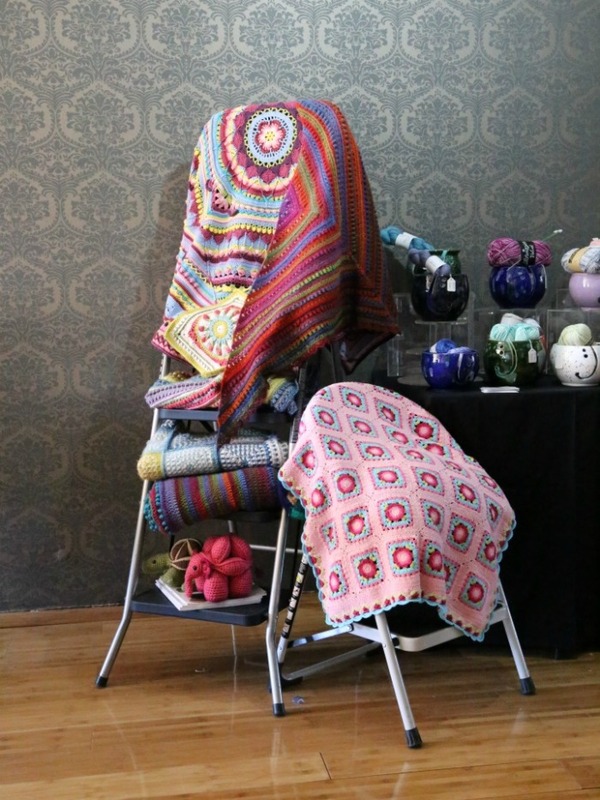 My aim with these posts is to introduce you to some of the wonderful people we met, and to show you some of the beautiful creations they brought along to the workshops. If I told you that I was extremely nervous about the workshops, would you believe me? 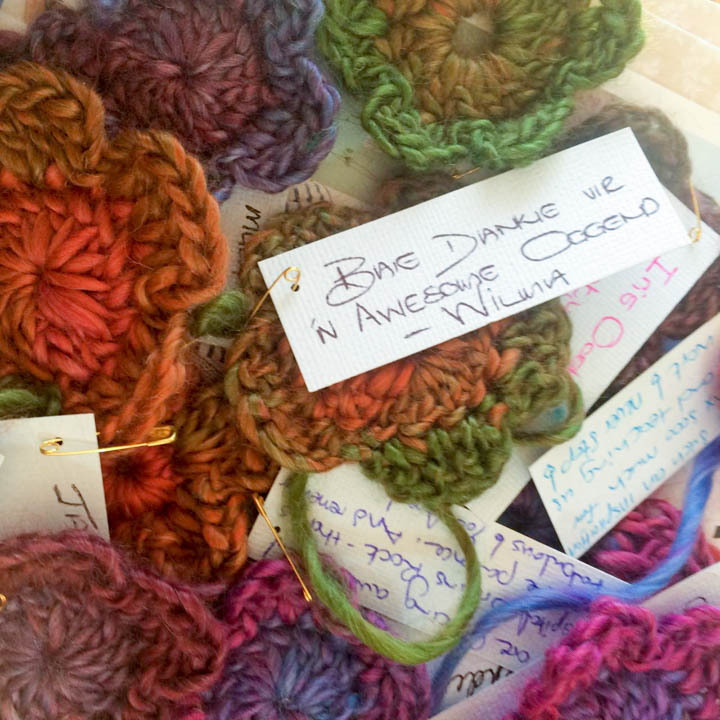 When I walked into 27 Boxes that first day, I had 2 previous workshops to my name: teaching the Brownies to make a chain bracelet and teaching some ladies at church to make a simple granny square. 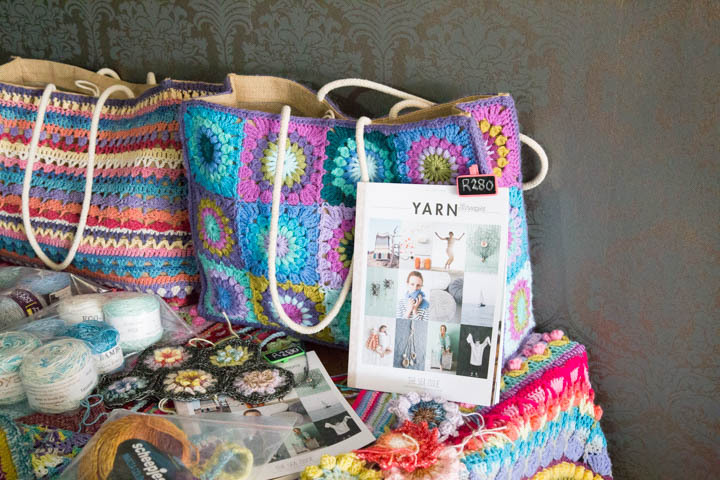 I had done 2 Weekend Retreats with Devon Sun Yarns (you can read more about them HERE and HERE), but there had only been 12 ladies each time and we had had all weekend to ‘get it right’. Facing 30 women at once, especially if you are shy, is daunting! Luckily there was so much stuff to set up before everyone arrived that I didn’t have time to work myself up into too much of a frenzy. The Be Inspired girls, Chantal and Julie, set up a beautiful display in one corner of the venue. 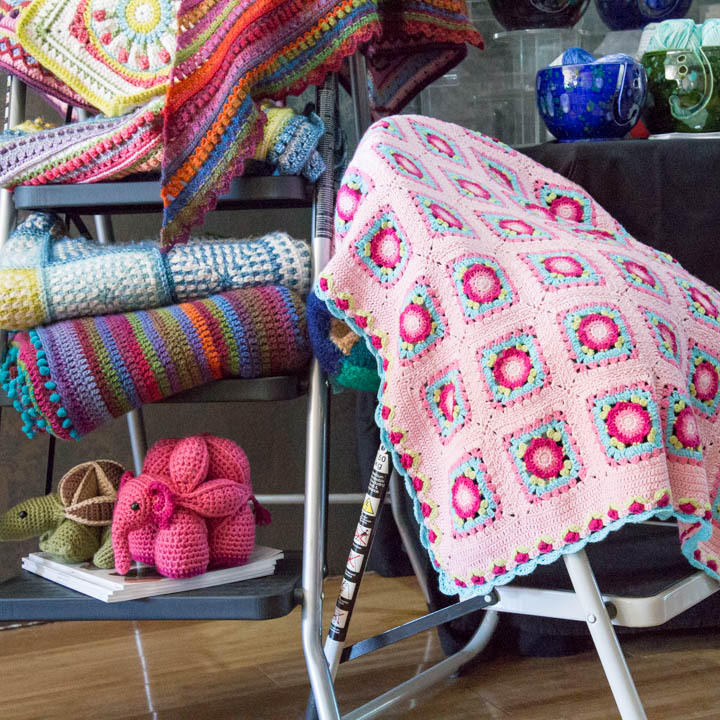 The tables were covered with the most vibrant array of crochet items, yarn, hooks, and books. Oh, and the goody bags for the workshop…and all the gifts for the prize draws. 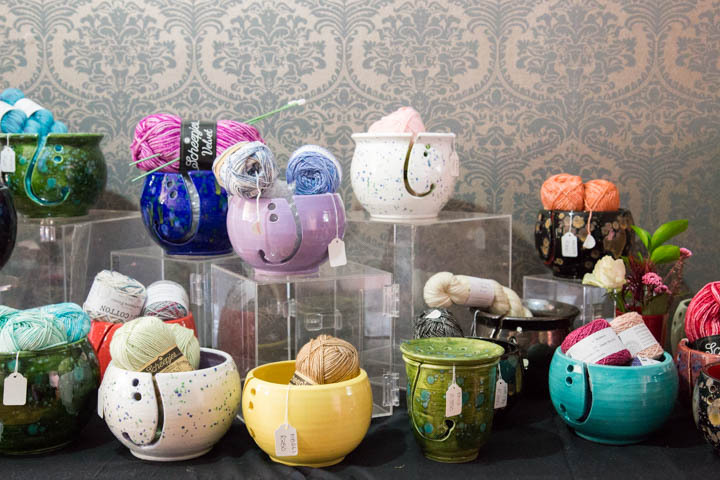 On the opposite side of the room, there was a beautiful display of yarn bowls by Maureen from MoBee Ceramics. Right next to that, my own Look At What I Made display. Just as an aside, may I tell you that it is not easy fitting all those blankets into a suitcase and flying them around the country! 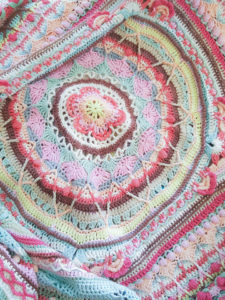 Clockwise From Top Left: Sophie’s Universe (Softfun), Wishing Well Square, Namaqualand Shawl, Lydia Blanket, Elephant and Turtle Amamani, Joy’s Journey, Linen Stitch Manghan, and Namaqualand Blanket. The morning workshop was so busy that I didn’t have time to take photos of any of the ladies or the beautiful items they had brought along for show and tell. I digress. Back to the workshops. As I mentioned in my last post, I asked each attendee to make one simple flower that I could turn into a memory blanket. This is a photo of my very first haul of Nonyaka flowers. One delightful lady I met was Theresa Bouwer (@theresabouwer on Instagram). She made me this cute handmade keyring and I love the little yarn ball!! 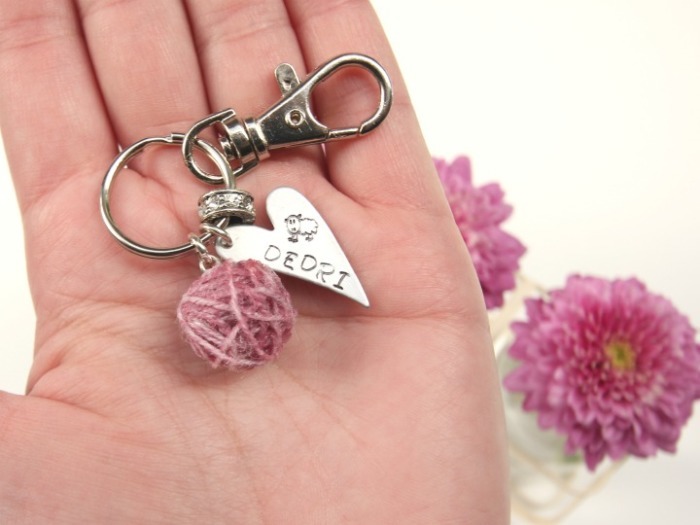 You can buy similar ‘I love Crochet’ keyrings from Be Inspired HERE. 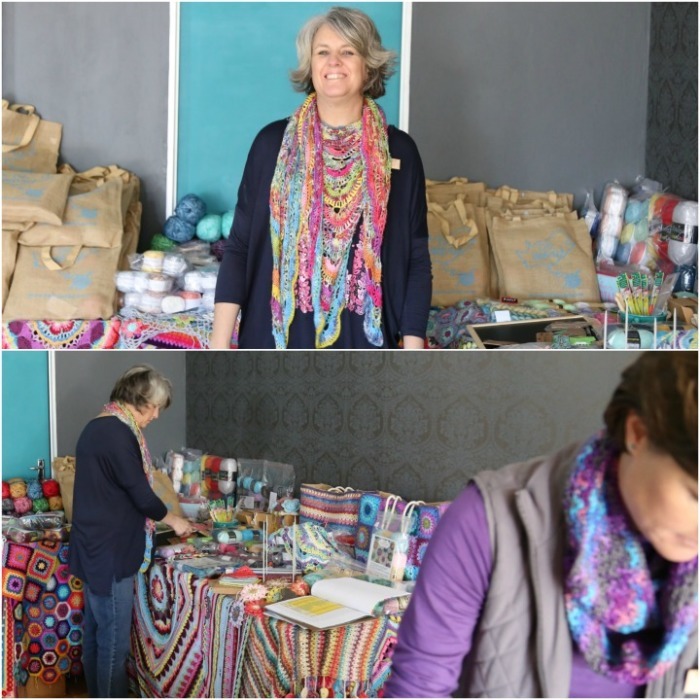 I also had the privilege of meeting Marlene Fourie from One of a Kind Yarns. 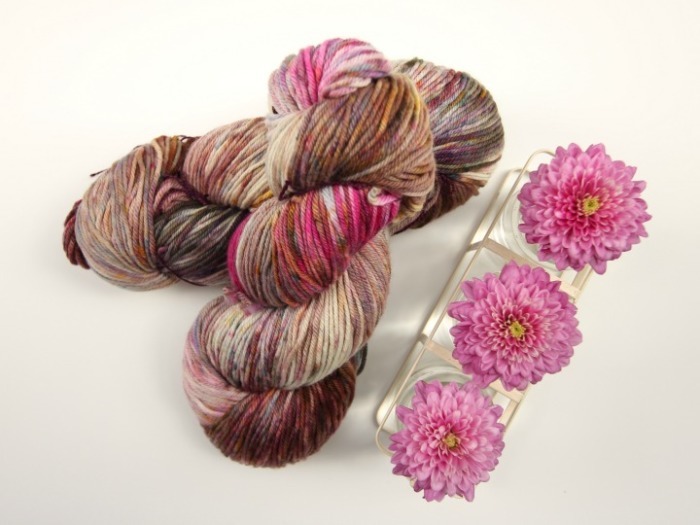 She is kind and funny, and her yarns are gorgeous! Don’t you just love all the different flecks of colour? We took a group photo after the morning workshop and I wish we had done it for every workshop. You can see Marlene standing far right in this photo (the lady with the gorgeous shawl). Julie, me, and Chantal (another gorgeous shawl) are right in front and Theresa Bouwer is just behind Chantal (to the right). I wish that I could tell you about every single person I met, because each of them made the morning special in their own unique way and I cannot thank them enough for making my very first workshop so much fun! Their stories touched me and their sense of humour delighted me! For the afternoon session, we had a much smaller group, which was good, because by that time the cold I had been fighting for a couple of days had turned into something more. Regardless of that, we had a wonderful cozy afternoon. Once again I didn’t take many photos (don’t worry, I took lots of photos at all the other workshops! ), but I did manage to take a photo of this beautiful Ice-cream Sophie by Kim Blair (@kimtraceyblair on Instagram). 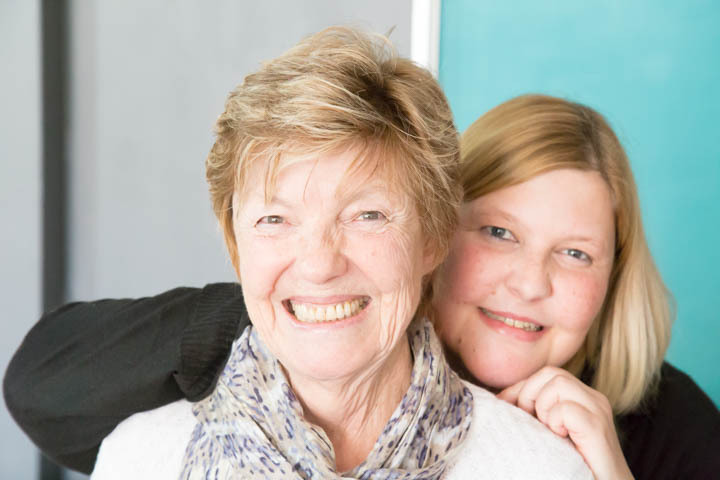 I would like to thank my friend Shirley for helping to organize the Johannesburg workshops. She has the most wonderful little store in 27 Boxes called ‘Jewellery Experience’, and she made me this cute brooch. Shirley and her mom also gave me a beautiful Shweshwe bag filled with goodies. This is Shirley and her mom Gloria. We saw Shirley and Gloria again that evening when we attended a dinner hosted by one of the ladies who had come to the morning workshop. 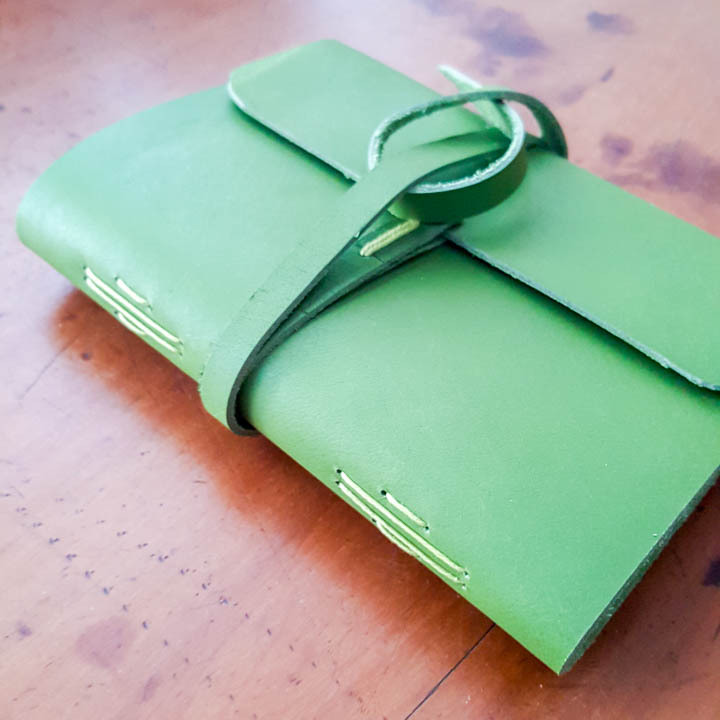 There I met Paddy, who hadn’t been able to attend the workshops, and she gave me this beautiful handbound journal. I am already using it to jot down new patterns and ideas. 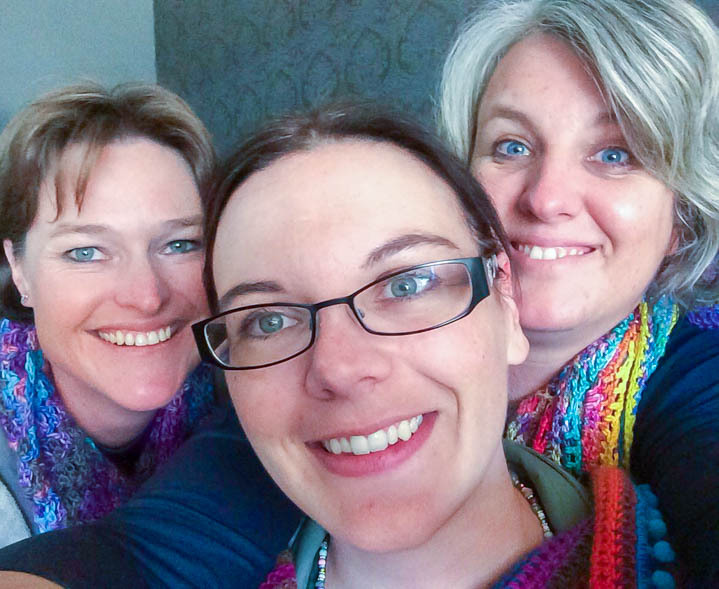 I will leave you with a Selfie :) This is Julie, Chantal, and yours truly. I wish I could have joined Dedri on her SA tour and taken part in a workshop. 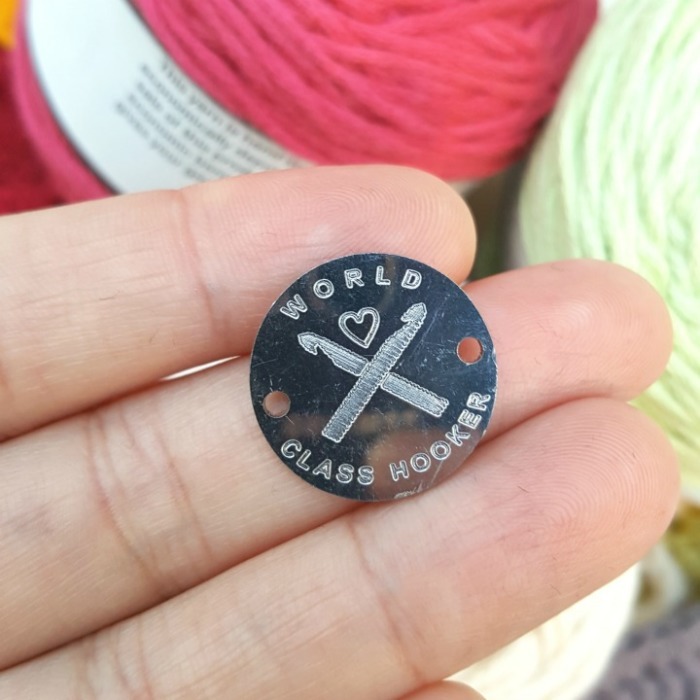 Happy hooking at Yarndale and all the other fun things you do and keep on inspiring us. Of course, it goes without saying – come back!! THANK YOU so much, Dedri :) I’ll be checking impatiently, HeHeeee…. 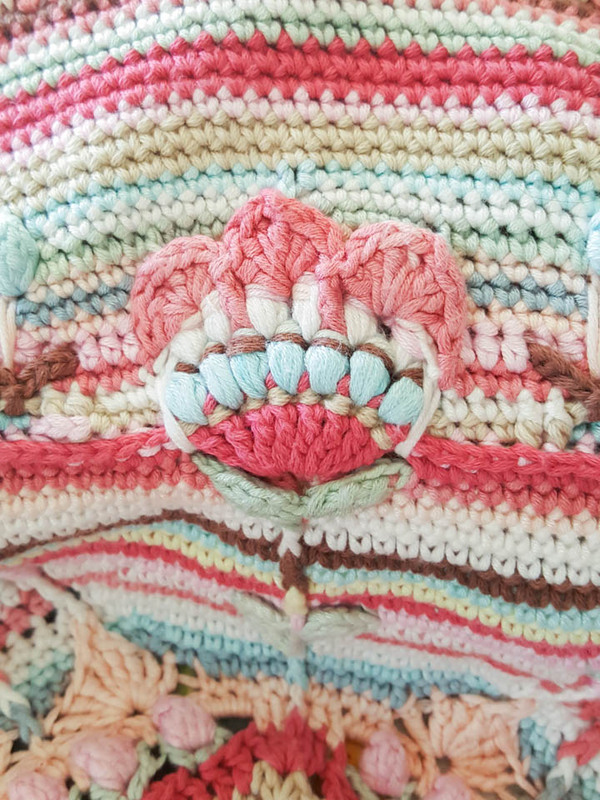 I have Fallen in love with YOUR GORGEOUS NONYAKA FLOWERS (I bet your memory blanket is gonna be absolutely gorgeous)… and I would SO MUCH love to make many of these, too. Is there a possibility to get some explanation/pattern/tutorial – any help that suits you – , pease Dedri ? 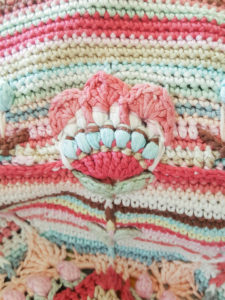 I am so pleased to hear that you are enjoying your new foray into crochet! 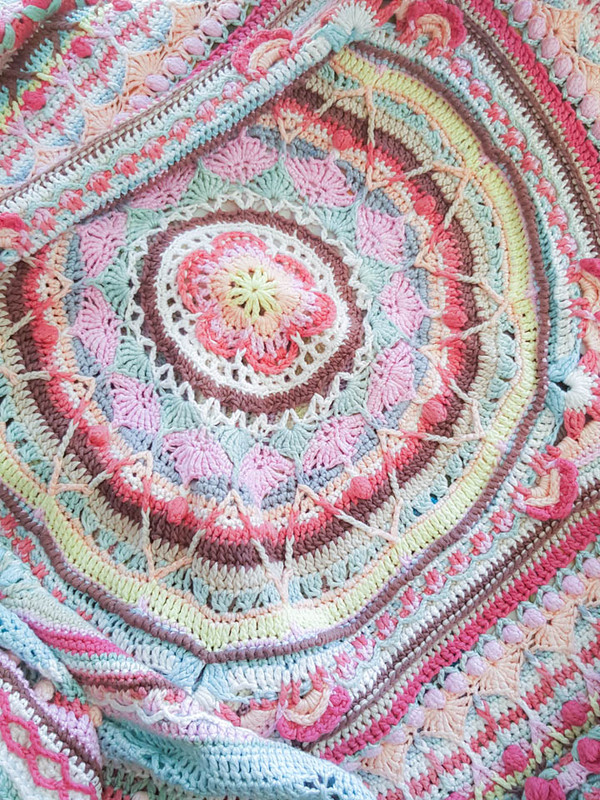 I’m glad you like the flowers :) The pattern will be available as soon as I have joined them all to make the blanket. I am hoping to make it for myself as a Christmas gift…we shall see!